This is marginally better than most, with a few offbeat comic ideas, a reliably droll performance from Vaughn, and, as the parents, four watchable old troupers in search of a fat paycheck. You can see most of the big slapstick set-pieces looming long before they hit but there are a few smaller routines that pack a punch just because they have an unexpectedly manic tilt to them. Gordon's stars are charmless, his script cheerless, and his sterling supporting cast can't seem to figure out what they've been brought on board to do. Didn't quite get over the hump. Oh, the hilarity of hating your family at the holidays. These embarrassing truths, indeed the entire film, take a great deal of hard swallowing. The mawkish ending is thoroughly predictable. But it's not quite as ghastly as the ingredients might suggest. In this egregious Christmas movie, Vince Vaughn and Reese Witherspoon each demonstrate the classic "Hollywood romcom" face: waxy as a corpse, dead-eyed with self-loathing. Vince Vaughn and Reese Witherspoon play the leads. Do they convince as lawyers or lovers? No. Do they convince as space aliens trying to infiltrate the human race? Yes. Seems intent on being as generic and lowbrow as possible, with broad slapstick emphasized over witty dialogue or interesting characters. We've enjoyed their cocky selfishness; just as much, we bask in schadenfreude when they get guilted into making the familial trail of tears. Four Christmases is refreshingly tart and lean, forgoing the usual schmaltz and syrup of the season. The difference between the average unfunny comedy and this one is the difference between Grandpa telling you knock-knock jokes and Grandpa telling you knock-knock jokes with his bathrobe open as his hand creeps up your thigh. Think of it as fun tear-away wrapping on what's essentially a boring pair of socks. It really needs to be stamped Don't Open Until DVD. It's Four Christmases in need of a wedding, or maybe a funeral. One and a half Christmases is about all that's worth celebrating in Four Christmases. To brand, then dismiss, Four Christmases as a disappointment would be giving it too much credit -- never, for a second, did this New Line Cinema cast-off scream or even whisper decent in the run-up to its opening. Several maraschino cherries short of a fruitcake. A sequence in which they dress up as Mary and Joseph for a Nativity play is genuinely funny. The rest of Four Christmases doesn't do them justice. Ho, ho, ho? No, no, no. This being a Christmas comedy of sorts, it demands a happy ending of sorts. And a moral too. When will filmmakers learn that if you start with Bad Santa and finish with It's a Wonderful Life, you just end up with curdled eggnog? The acrid, wince-worthy Four Christmases may well be part of the war on Christmas Bill O'Reilly's always fog-horning about. Christmas and Christianity will survive it. But barely. To say that Vaughn is phoning it in these days would be an insult to telecommuters everywhere. In the end, a musty procreation moral is left to push forth this flimsy plot -- and that's neither original nor particularly funny. The result is two bad movies in one: a gimmicky romantic comedy, and one of those seasonal headaches that submits loud family dysfunction as a vehicle for Christmas cheer. It's four home-for-the-holidays comedies in one, and the variety-pack structure works for the movie: Each nightmare household has a wacked flavor all its own, and none wears out its welcome. 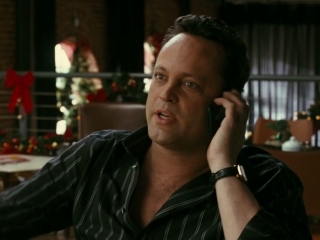 'When in doubt, bring on the projectile baby vomit' appears to be the guiding comedic principle behind Four Christmases. Like a gift card in your stocking, the romantic comedy Four Christmases is pretty generic, though you might still be grateful for it. Dismaying, indeed, that a movie purportedly selling itself on refreshing nay-saying scepticism should so cravenly succumb to the same old schmaltz. This comedy about a happy couple made miserable by having to visit four divorced parents begins with a bang but settles into sentiment so maudlin that even this cast can't save it. This is what happens when a successful indie documentary filmmaker gets sucked in by the Hollywood system. Vaughn makes the movie tolerable here and there, but this kind of slapsticky physical comedy doesn't suit Witherspoon at all. Is it funny? Yeah. Sometimes very. Four Christmases to deliver a quadruple dose of dysfunctional family hijinks to genuinely dispiriting results. [An] oddly misanthropic, occasionally amusing but thoroughly cheerless holiday attraction.